It's been a while. Life has been a little crazy these past few months, with me moving to London, and then my parents moving to Portugal, but I'm (hopefully) back for good! 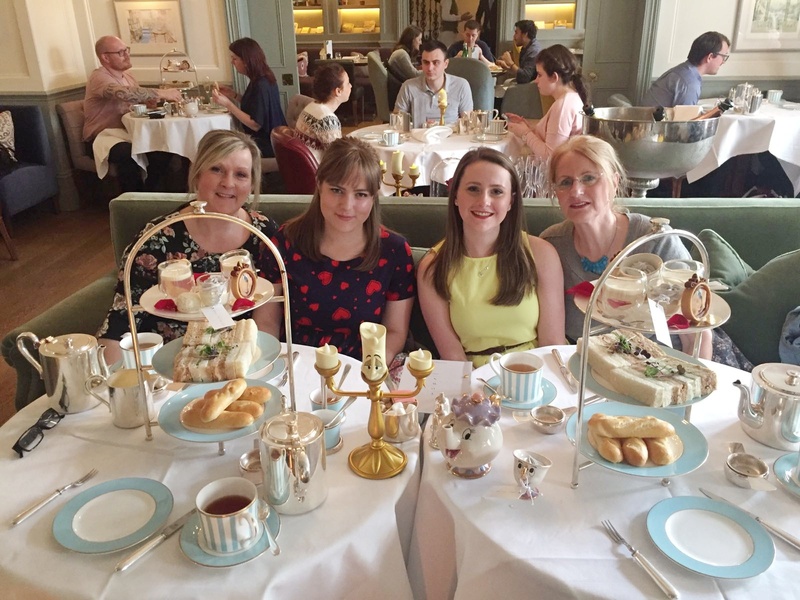 Literally days before my parents moved to Portugal, my mum came into London to see me, and we went to the Beauty and the Beast themed afternoon tea at the Town House with Sophie and her mum. We had a midday booking, so got there for about 11:45 and sat in the bar outside for a little while. We were then taken into the restaurant, which was a lot smaller than expected, and we found ourselves on two tables next to the fireplace. The restaurant itself was a perfect location, and the detailing inside the room was just perfect. Each table had a Lumiere light, there were Cogsworth clocks around the room, and there were red roses everywhere. Firstly, we picked our teas. I had an Earl Grey, Sophie and her mum had a white tea, and my mum had the Rooibos. We were then each served a plate with three small starters - a beef ragu aranchini, a cheese souffle and a bite size vension pie. Marie, the baguettes, hurry up! Then came the main spread. Starting from the bottom, we had Marie's sweet brioche baguettes, which were accompanied by a chocolate pot and apricot preserve. These were absolutely delicious, and it made both Sophie and I laugh a lot, when the waiter (whilst explaining the spread) told us with a completely straight face that they were shaped like baguettes because there were baguettes in the movie. Next we had a plate of sandwiches each, which were pretty bog standard. I would have loved for them to theme these, but to be honest we didn't eat half of them because there was so much food. Finally we had the top tier, which was in my opinion the best! First off, we had the grey stuff, which was in fact delicious! One of the two came in a tiny chip mug, and the other in a plain glass. We then had the rose jelly, which was utterly genius. It was an edible rose petal, suspended in a clear vanilla jelly. Before we began eating, the waiter turned it the right way up and topped it with cream, which of course was served from Mrs Potts. A broken clock is right two times a day, mon ami. There were three other treats each on the top tier. Firstly, we had what was possibly my favourite treat, the Cogsworth chocolate tart. This was so well done, and super delicious. We then had a spiced coconut and chocolate macaron, which was to represent the snowball fight, and finally we had a speculoos and marzipan biscuit, which was in the shape of Belle's yellow ball gown. All in all, the entire menu was so incredibly thought out, and there wasn't any part of it that I didn't enjoy. If you get the chance to go, I'd definitely recommend it, although I'm pretty certain it's fully booked until November!